I’m still working on finishing touches (including bedside lighting!) in the bedroom, but now I that I’ve finally hit my stride and gotten fully into all painting, all the time mode, I’m barreling forward into the living room. It doesn’t look quite as bleak as the bedroom did since I do actually have furniture and stuff that I moved here from New York, but it’s dark and dreary and SHINY and TAN and really just not nice at all. And yes, that television is HUGE. The television belongs to my housemate, and while I’m personally not a fan of ginormous screens, the fact that the rest of the house is pretty much filled with my belongings means that I really just need to accept the TV. You know? And yeah, I’ll admit it…it’s fun to watch movies on it. Hell, it’s fun to watch Better Call Saul on it. I’ve made peace with the television. In case you’ve been wondering what the worst two-color combination in the entire world is, I’d like to submit this photo to make the case for NEON ORANGE and TAN. And if you’re looking for the worst three-color combination, how about NEON ORANGE and TAN and RED? Is that even red, really? Brick red? I guess it’s more of a wine? Whatever it is, I’m sorry, bench. You didn’t do anything to deserve this. So the walls are going to be Valspar Swiss Coffee (just like the bedroom), and the front door will be Valspar Royal Navy (again, just like the bedroom). Yep, same as always! Anna Dorfman, playin’ it safe since 1975. One of the few furniture purchases I made after moving here was these two Wafer Tables from CB2. The living room is pretty small, and there just isn’t space for a full-size coffee table. I looked and looked and looked, and finally I found these little guys. I LOVE THEM. The grain of the wood is so pretty, and they’re super sturdy. See that thing on the wall behind the sofa? That’s a gas-powered heater. I had never seen anything like it before moving here, but I guess they’re pretty common in this part of the country. New Mexico has me perpetually mystified about things like heating systems, swamp coolers, and textured walls. Oh, and plumbing shutoffs are OUTSIDE the house? And cars don’t have license plates on the front end? I should really start making a list. For now at least, my books and records are going to stay stacked and shelf-less. I haven’t figured out whether it makes more sense to keep them out here or move them to my office, and still need to buy a new record player. I definitely need to neaten these stacks up, though! I’m amazed by how few books I have now—in my line of work they do tend to accumulate, and I did a major overhaul of my library before I left New York. I’ve had a few moments of regret already when I looked for books (and records…and 90% of my CDs…) that I must have given away. Oh well. It’s a good excuse to buy more! I saved the best for last—the living room windows. They’re 6-over-6 divided light sash windows, and they’re so pretty. Sadly, they’ve been pretty neglected for a long time, and they need a lot of attention. I never met an old wood window I didn’t like, so it’s my pleasure to clean them up and get them in working order. I can’t wait to get the paint off the locks and shine up that brass! OK, OK. 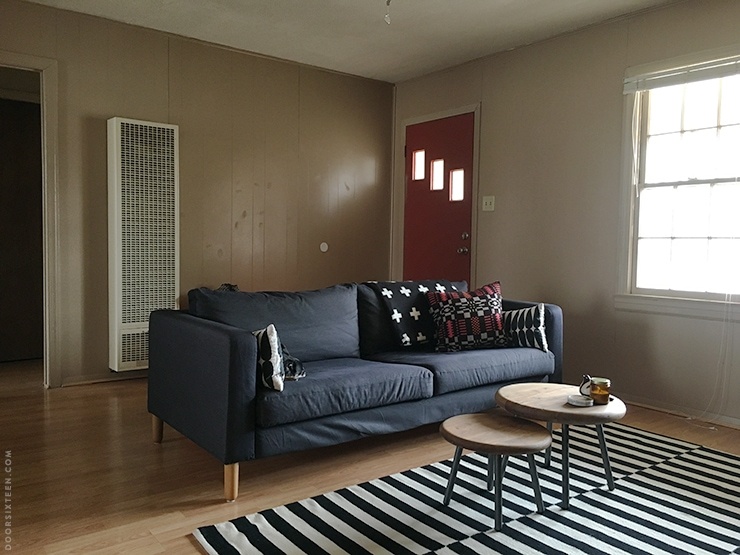 In the interest of full disclosure, I’ll let you in on a little secret: I finished painting this room two weeks ago. I’m sitting in it right now, in fact, admiring the white walls. I’ve been so busy with work and with painting other rooms since then, so I haven’t gotten this post up in a timely fashion. In other words, the “after” photos will be here really soon! when we first moved to santa fe 2.5 years ago, we had a heater just like that. it was in the wall between the living room and the bedroom. it kind of scared me. i didn’t want to get near it. our current place does not have one of these as it has baseboard heating. looking forward to seeing what you’ve done with the place! I CAN’T WAAAAAAIIIIIITTT! Also, I still maintain that I love the books stacked against the wall like that. So excited to see the after!! Important question: could those tables double as stools when one needs extra seating? Or are they not quite *that* sturdy? Clare, they’re definitely sturdy enough to be used as stools, but they’re a bit on the low side to be really comfortable for that kind of thing. Fine for sitting for 15 minutes or so, but you probably wouldn’t want to sit for much longer than that (unless you’re a kid!). As a multi-time expat (four countries!) I am laughing at (with?) your culture shock from crossing the USA. But good for you. As my grandma (and Nietzche?) said: what doesn’t kill us makes us stronger. Love seeing the living room and eager to see your magic. Personally, I think TVs should be hidden. That they exist, OK, but do we need to acknowledge that all day long? Now that they are flat, they seem to think they can go anywhere they like, but in our house we have not yet succumbed to flat screens (for economic reasons or else husband would have purchased one long ago) and we slam the doors on our big, fat, year-2000 TV during the day. If it makes you feel better, our historically correctly preserved windows are about to be installed and cost us a small fortune and most of our rooms will be painted the most blindingly white possible. So from New Mexico to the south of France, here’s to trying to make the most aesthetic of situations. I usually think “hidden” TVs are more noticeable, weirdly! And honestly, if I’m going to use something at least once a day, it’s not a huge deal for it to be out in the open. I think there are ways to incorporate TVs into decor without them dominating the room. I really love following your blog because you share the ups and downs of projects and you also have great style. What is with that ceiling?!? I don’t know! It’s the texture of an English muffin. And English muffin with a giant crack down the middle. Any chance you can point me to a good tutorial for fixing/refreshing original wood windows? I’m about to inherit a house full of them, all painted very strange colors and in various states of disrepair. I want to repair/reseal/paint them rather than replace them, but I haven’t been able to find information on what that entails. HELP!?! I was recently pointed to “Working windows : a guide to the repair and restoration of wood windows” by Terry Meany. I haven’t read it yet, but it might be worth looking into. That heater was the first thing I noticed. Here in NorCal, I have never lived in a place without one, but ideals and tutorials for what to do with them are pretty thin on the ground. In my current place, the cover was an abysmal shade of cracked tan paint, it was bent, and also getting rusty. I was able to find a new cover free on Craigslist and cleaned it up and painted it with white high-heat paint. Now it matches the trim, at least. I hope more bloggers move west and have to deal with these. Hi, I’m new to your blog since you moved, but I look forward to seeing what you do with the new house. 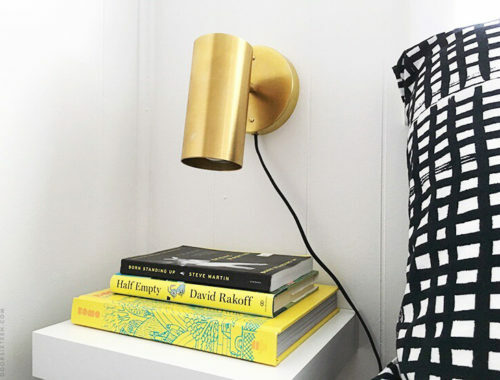 Looking at the picture of your stacks of books and the fact that you said they may stay there for now: Have you considered stacking the books in even heights and getting a thick board to put across the top of them to create a console table that the lamp could sit on top of? When I envision it in my head looking at you picture it seems like a viable, possible good looking option. Just an idea! Hi there! 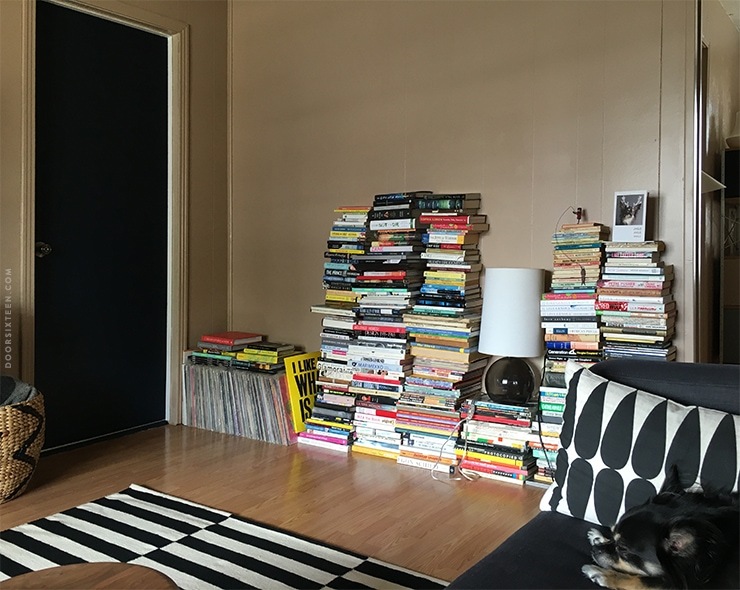 🙂 I do like how that looks (like in Sandra’s house), but the downside is that it becomes really tricky to take a book out without having to take apart the whole thing—and I need to be able to easily access my books. Bookshelves will happen eventually! I just wanted to mention that I actually forgot to watch the latest episode of Better Call Saul – and when I read it here I immediately switched to Netflix but then CAME BACK because I couldn’t wait to read the the rest of your post either. So … you won the battle against Netflix here, I guess. Congratulations! Hahaha!!! It’s a GREAT season finale. GO WATCH!! That last bit about not having to wait long for the afters was goooood to read! Can’t wait to see the pics. We had an ugly corner TV/cabinet/wires/cobwebs situation in our living room that is now a distant memory. 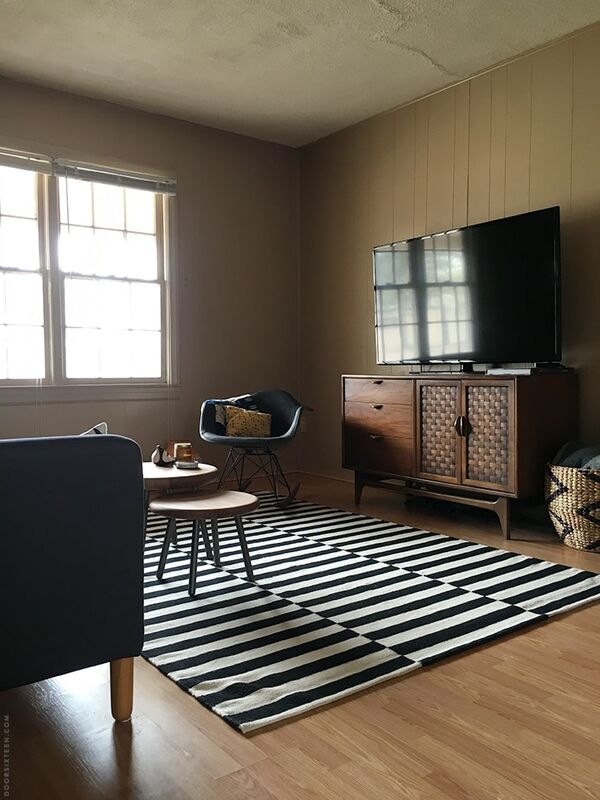 My husband constructed a beautiful ply and white faudenza (thanks for the inspiration!) and we wall mounted the tv on a movable bracket in the position it would be if it had a stand which means it takes up less space and can be angled out if you need to. It looks great and all so much more visually lighter with everything off the floor. 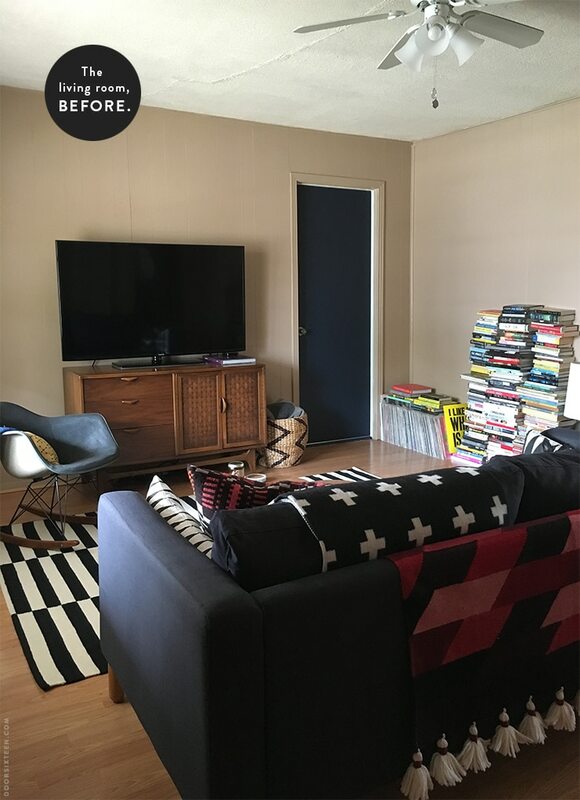 For the books could you do something like Daniels living room shelving? I am working on the husband to do that with ours. Story of our blog… so far. We started renovating our house a couple of years ago and FINALLY got our main level in order. But my husband and I decided to start a blog and now we’re playing catch-up! 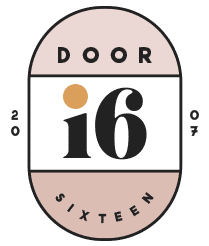 We’ve got a couple of projects on the docket that i’m really excited to share in real-time. Annnnd, now i’m going to go watch the season finale of Better Call Saul!!! EEEE! An update! Yay, I so look forward to it! A New Yorker in New Mexico is an intriguing change and I must say, you do it with style! Have followed you, like forever, and so this new journey is extra special…can’t wait to see more! Oh Anna! That Heinz Tomato Soup ‘red’ door is truly hideous! The only time I’ve seen gloss paint on walls is in my brother’s house when he lived in Darwin. It’s about 90% humidity for 6 months of the year and they needed to wipe the condensation off the walls. Equally gross. So psyched about Navy. I think it makes colours pop even more than black – especially orange. They seem to vibrate when they’re next to each other. Can’t wait for the after photos. you have a housemate? is it someone you met in NM or someone you knew previously? is it hard living with a new person? i know, totally none of my beeswax. just really curious. Your blog is great, I’ve just discovered it and cannot wait to see how the living room turns out. Could you please tell me where that blanket on the back of the couch is from? Thank you! Any worst combination involves the colour wine. I love the fact that you shop at Ikea because I seriously love, love Ikea. Just please tell me that you go to the Clearance section first, and that instead of waiting for the store to open you go thru and have breakfast first and then run down quickly to beat everyone to the best clearance deals. I now have to hide my Ikea clearance deals as I think I am becoming a Ikea hoarder. There are only so many pillow covers and $3.00 pillows I can give away to family. HI Anna – Stumbled onto your blog and love it! Sooo, I moved into new house (new to me) with old sash windows. I’m looking to refinish them rather than replacing them. Of course this means I have to strip off layers of paint which most likely contain lead. Any experience/recommendations on where to start? Hi Kay! Congrats on your decision to restore your sash windows—it’s worth the time and effort! haha! i love the disclaimer! by the time i got to it, i was dreading the wait for the “after” post. bring it on! I knew it! I knew it! I knew it! 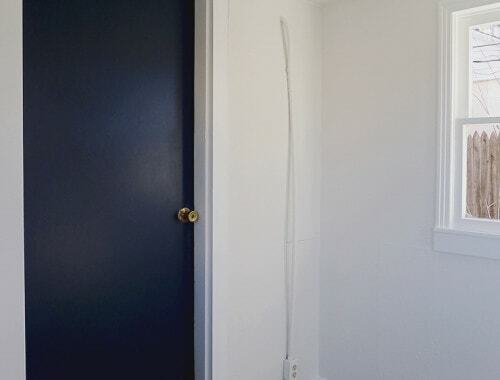 As I read this post my inner monologue screamed “no way she’s lived with that wall colour for this long”. I am the same way. And p.s. I had to change gyms because they painted the walls RUST and EGGNOG. Haha, it’s only been a couple of weeks since I painted it…so yeah, I really did live with it for that long! Those gas heaters are a west-of-the-Mississippi thing. I’d never seen them before I moved to California, and they followed me to New Mexico. 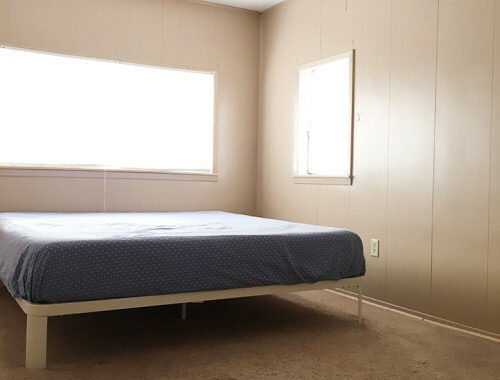 The heinous popcorn ceilings and textured walls… those are all NM. And the tan! 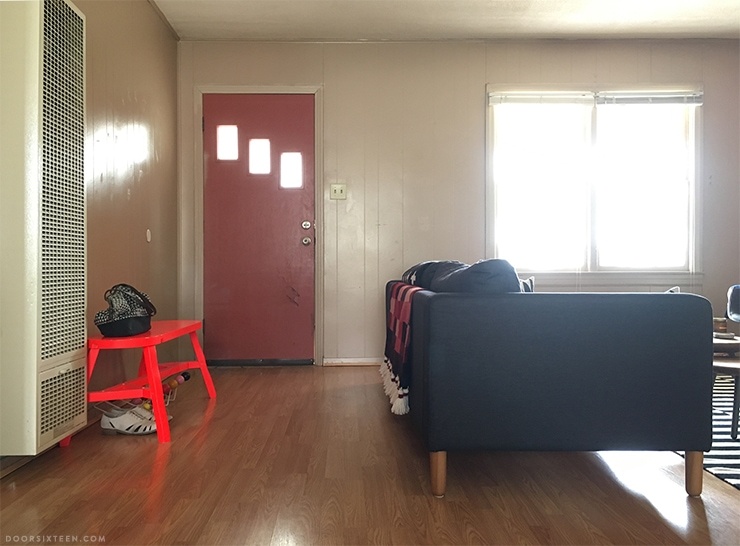 The first house we lived in here in Las Cruces was deep taupe, and kinda dark, so the popcorn ceiling was the only source of light and glowed against the walls… ugh. Wishing you good Portales karma as you spiff up your place. Have you checked out the Taco Box yet? I have a paint question. I was reading through your FAQ and saw that in your previous home, you used Benjamin Moore paints, and here you are using Valspar. Was there a reason for the switch? Maybe it’s easier to pick up Valspar in your new location? I have some pretty bold colors in my Victorian that I picked out 12 years ago. I think I’m ready to go towards the light [white] 🙂 I don’t have Valspar or BM paint nearby, so I guess I could take a swatch into my local paint place from either brand and have it matched. Thanks! Hi Jenne, yeah, that was the initial reason—there’s nowhere to buy BM paint here. As it turns out, though, Valspar Reserve is just as good as my old fave BM Aura, and it’s cheaper, too. Cannot wait to see the after! About 7 moves/15yrs ago, an old housemate dubbed that dull tan ‘grandma’s pantyhose’ (as if it were not already horrifying enough just to look at, the name stuck), and its removal from walls has been part of any move in since. I wonder how long it will be before we feel a similar way about the new ubiquitous neutral grey? so it has been 6 weeks and no post! What a tease, getting bored visiting with no updates. Why mention in then nothing? Because life can be difficult, Lyn. I often have to put my health and wellbeing before my blog.